Nature-lovers will be enchanted by this Central American gem - boasting never-ending wonders, from wonderful wildlife to dramatic volcanoes. The 4-star Studio Hotel in San Jose is perfectly located, offering sweeping views of the surrounding Central Valley. Hotel facilities include a restaurant, bar, terrace and outdoor swimming pool. Bedrooms have private facilities, air-conditioning and tea/coffee-making facilities. The lodge is positioned extremely close to the extraordinary Tortuguero National Park. The National Park is famed for the huge variety of biodiversity, as depicted by the 11 differing habitats, including rainforests, mangrove forests, swamps, beaches and lagoons. The 3-star Tilajari Resort in Muelle de San Carlos is perfectly located amid wonderful scenery near the San Carlos River. Hotel facilities include a restaurant, bar/lounge, three outdoor swimming pools and a fitness centre. Bedrooms have private facilities, air-conditioning, safe, TV and hairdryer. Hotel Fonda Vela is informal hillside hotel, located nearby Monteverde Cloud Forest Biological Reserve. It has its own beautiful gardens with a variety of places to go birdwatching. Each room is en-suite and has a TV, a minibar, satellite channels and a hairdryer. Hotel also features an indoor pool, a restaurant, a bar, WiFi access and a private parking. The 3-star La Gran Francia Hotel is located right in the heart of the historical colonial city of Granada. Hotel facilities include a restaurant and swimming pool. Bedrooms have private facilities, air-conditioning, hairdryer and TV. Nammbu Beach Front Bungalows provides its guests with a stunning location, which complements its service and facilities perfectly. The outside pool area is surrounded by lush greenery and offers views of the beach. Free WiFi is available throughout the property and there is an in-house restaurant where both local and American inspired cuisine is served. The air conditioned and contemporarily styled rooms come furnished with private facilities, a fridge and a TV. Depart on your scheduled flight to San José. We will transfer you to your hotel on arrival. Your adventure begins with a guided tour of San José, the capital of Costa Rica. We'll introduce you to sights such as the National Theatre and the Gold Museum. Then, when you have your bearings, the rest of the day is yours to do as you please. Today you're heading to Tortuguero National Park, which is home to an array of wildlife including monkeys, sloths, crocodiles and caymans. Our journey takes us through the Braulio Carrillo National Park and across the Continental Divide, where you'll take in breathtaking views of primary forests. Towards the end of your journey, we will transfer you to your lodge by boat. This afternoon you'll learn all about sea turtles when we visit the Tortuguero Village and the Caribbean Conservation Museum. There's a full day of activities ahead including, if conditions are right, two boat trips through jungle-sheltered canals. We are going to leave Tortuguero National Park by boat and then drive to Muelle de San Carlos. This will be our base for the next three nights as we explore the area around the Arenal Volcano, which has been active since 1968. Today is yours to spend at leisure enjoying the facilities at your hotel or exploring more at your own pace. Alternatively, we highly recommend an optional visit to the Hanging Bridges of Arenal, set in a natural paradise of 600 acres of protected rainforest. Here you'll head along a walking trail and take in stunning views from a series of bridges which are suspended high above the lush forest canopy. As you go, look out for an amazing variety of wildlife too. 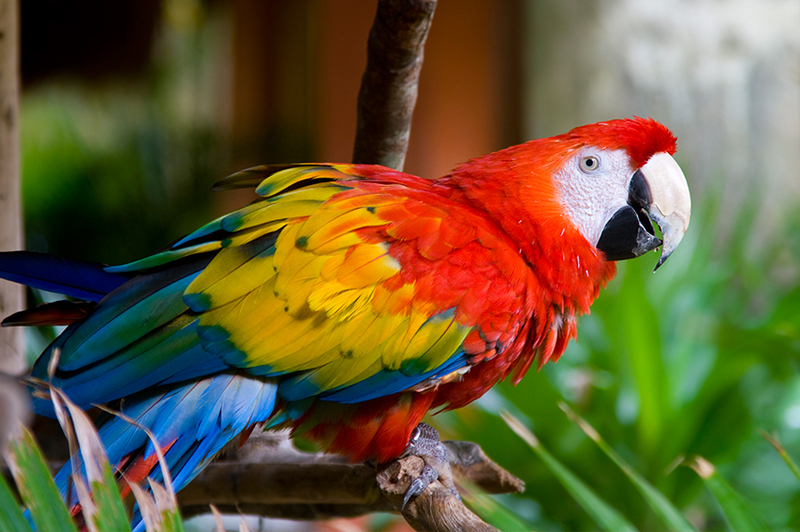 The reserve is a haven to more than 250 species of birds, reptiles such as the basilisk lizard and many types of mammal, from howler monkeys to three-toed sloths. You'll also visit the mountain town of La Fortuna, loomed over by the majestic Arenal Volcano, and if you want to see even more, you can join a further optional trip late this afternoon. We'll head to the Eco Termales hot springs, where the chance to relax in the soothing waters surrounded by rainforest is a great end to your day. There's a bar if you would like to sip a cocktail as you bathe, and a colonial-style restaurant, where dinner is included. Enjoy a relaxing morning or join an optional boat trip along the Peñas Blancas River. 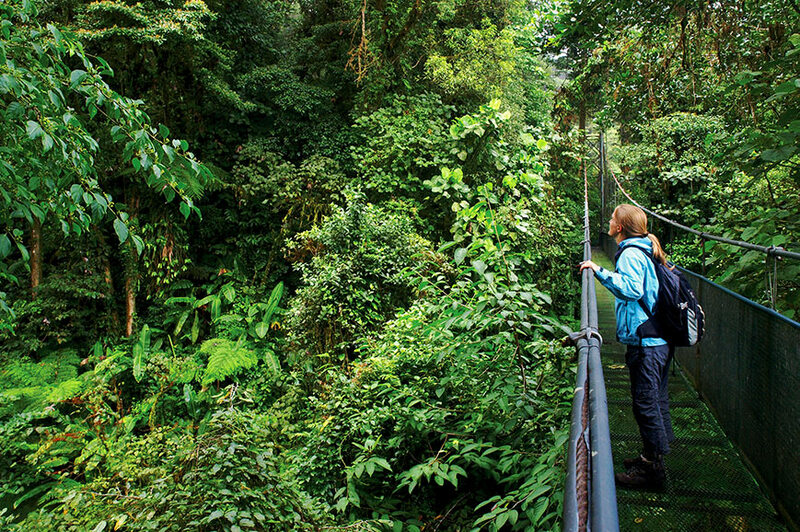 This afternoon there's a guided walk through the rainforest to look forward to. We're moving on to Monteverde today, a journey that takes us along scenic and sometimes bumpy roads! American Quakers set up the Monteverde Cloud Forest Reserve in the 1950s and now it's home many different species of birds and mammals, including the howler monkey. Lunch is included at a coffee farm along the way, and this afternoon we'll listen to a fascinating talk by a descendent of the original Quaker settlers. After a tour of Monteverde village we will transfer you to your hotel. Then, if you choose to join our optional excursion, there's a guided forest walk this evening. You will learn all about the cloud forest when we visit a nature reserve today. This afternoon is all yours, or there are optional activities to choose from if you wish. After breakfast we'll journey by road to Rincon de la Vieja, nestled amongst the volcanic Guanacaste Mountain Range. On route we'll visit Santa Rosa National Park, which protects some of the last remaining tropical dry forest in the world. There are 10 unique habitats here, providing a haven for many species of animals from big cats to spider monkeys, and we'll head off in search of wildlife on a guided tour. We're heading off on a hike through Rincon de la Vieja's scenic forest trail to the area's hot springs. These five natural pools were created by the Rincon de la Vieja volcano and you can relax in the soothing waters or enjoy a volcanic mud bath. There's even a bar and cafe if you'd like to treat yourself to a cold beer or a snack. You can spend today relaxing at the hotel and exploring at your own pace, or why not join one of our optional activities. You can choose a canopy tour, which takes you on a thrilling trip across the tree tops of Rincon de la Vieja's tropical forests. You'll be safely harnessed, and as you make your way across a series of platforms you'll be able to see a diverse range of flora and fauna on this thrilling adventure. Alternatively, you can walk across a series of 20-metre-high hanging bridges as you take in the tranquil beauty of primary forest. Again, the sights you'll see promise to be totally unforgettable. Another day of adventure takes us to Rincon de la Vieja National Park via the area's snow-white beaches. The park itself is a great place for a hike, thanks to the quality of its walking trails. On our guided tour we'll see a diverse range of flora and fauna amongst a breathtaking volcanic landscape of boiling mud pools and fumaroles. We'll then head to Guanacaste, where our beautiful hotel is located right beside a stretch of golden sand lapped by the Pacific Ocean. You'll see more exotic flora and fauna today on an included excursion to the Werner Sauter Biological Reserve, which was once a farm. Over two-and-a-half hours you'll hike through a mango plantation to this private reserve, eating mangoes as you go if you wish! Nature runs wild here and as you explore you'll not only see but feel and breathe this unique tropical dry forest as you learn about the plants and animals that thrive here, as well as the people who inhabited this land long before Christopher Columbus arrived in 1502. Afterwards you can spend some time on beautiful Samara Beach, with its white sands and aquamarine waters. We'll then return to your hotel, where you can spend the rest of the day at leisure. After breakfast we'll transfer you to the airport in San José for your flight back to the UK. You'll arrive in the UK today. With over 50 years of touring expertise, you are guaranteed an enriching experience with Travelsphere every time. Wherever you choose to explore, however you choose to travel, they believe it’s the people you’re with that make all the difference to your precious time away. Their Tour Managers are some of the best in the business and they work really hard to give you the holiday of your dreams. They work closely with Local Guides to show you the very best of a destination, from the iconic landmarks to the hidden gems, and are always on hand if you need tips, advice or just a friendly chat. They take care of everything for you, from organising the transport and booking the hotels to arranging visits to the ‘must-see’ sights as well as some undiscovered, off-the-beaten-track destinations. You’ll be accompanied by an experienced Tour Manager whose unrivalled knowledge and enthusiasm will help you to uncover the real heart and soul of a place. They understand how an amazing travel experience can make a lasting impression on people’s lives. That’s why they take such care to get it right. With guaranteed departures, guaranteed price promise and 100% financial protection, you are safe in Travelsphere’s hands. Visit website Enquire Free VIP private door-to-door airport transfers on worldwide holidays.